Last saw the potential start of a new era for Square-Enix's JRPGs in Bravely Default, but this week sees the end of an altogether different one with the release of the third game in the Final Fantasy XIII series, Lightning Returns. So grab your ridiculous sci-fi sunglasses, and paradigm shift into this week's Tuesday Game Room! Over 30 goddamn minutes to find a group! Fun fact: This particular queue would go on to last an hour and seven minutes. I managed to write both this TGR and an essay for University waiting for it to pop. Sheesh! Also, the recent US release of Bravely Default, as well as my post on some of the best reasons to play it suddenly getting mainpaged, kinda got me to play through it all again. I still absolutely love it. You're probably tired of hearing that, but I really, really don't care when it comes to Bravely Default. It's actually a really busy and really rather bizarre week for releases - leading the charge is the third (third!) 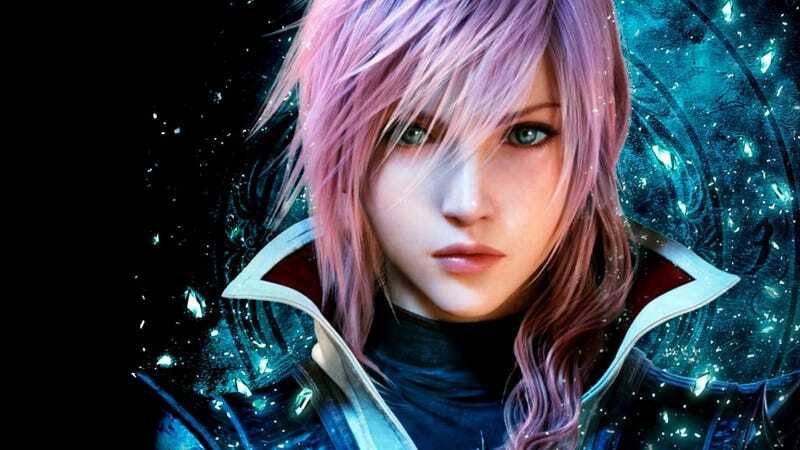 and presumably final entry in the Final Fantasy Fabula Nova Crystallis series is Lightning Returns: Final Fantasy XIII, out on Xbox 360 and PS3. It's a japanese love-in on handhelds too, with the Vita getting Danganrompa: Trigger Happy Havoc and Toukiden: The Age of Demons (also out on PSP) - not to be missed out, the 3DS joins in with One Piece: Romance Dawn. World of Tanks leaves beta and hits retail on Xbox 360, and SNK are randomly putting Metal Slug 3 out on PC. But it doesn't stop there! Like bundles? Because there's a weird amount of them all out this week! Civilization V: The Complete Edition on PC and The Witcher 2: Assassins of Kings Silver Edition on Xbox 360 bundle up their base games and their additional content, but as for double packs of games, a Borderlands 2 and Dishonoured Bundle hits the 360 and PS3, Far Cry Compilation hits PS3 alone (Far Cry Classic, the original game in the series, is also released as a separate title on XBLA and PSN), and - really, really weirdly - there's also a 360 and PS3 release of The Elder Scrolls V: Skyrim and Bioshock Infinite Bundle.Yeah. Finally, you can celebrate Valentine's Day with your loved one this Friday by curling up on the couch and playing the newly-released The Last of Us: Left Behind, the DLC prequel to Naughty Dog's depressive, beautiful PS3 exclusive that wowed the pants off everyone last year. Maybe stick to some flowers and a nice meal instead, eh? Flappy Bird becomes a crazy hit in what feels like a week, and is now pulled from sale by it's creator - Man, Flappy Bird has burned out of existence as quickly as it seemingly became the thing the Internet talked about for all of last week, with Vietnamese creator Dong Nguyen revealing that he removed the game from sale (despite it raking in $50,000 a day for him) due to his discomfort at people getting addicted to his frustratingly difficult game. Nguyen still wants to make more games despite his experience with Flappy Bird, but hopefully he can do so without the internet going crazy and sending death threats (seriously guys?) to him over twitter. The PS4 shines financially against an otherwise dour backdrop for Sony - It's nice to see Sony's Game division posting such lofty profits this past quarter, bolstered by the ridiculous sales of the PS4 (although no updated figures were released, it had sold 4.2 million by the end of 2013 alone) - however it's not looking so good for Kaz Hirai's company at large, which is selling off both its PC and Television divisions as they face massive losses in those fields and 5000 job losses. It's all part of Hirai's plan to save the floundering business though, which he's been putting into place after being promoted from the head of Sony Computer Entertainment to CEO 2 years ago. Deaf composer Mamoru Samuragochi admits fraud - Scandal swept through the Japanese music industry with the revelation last week that Samuragochi, often hailed as the country's own Beethoven, has been commissioning other composers to write his famous music for him over the last two decades without credit, as his own hearing problems worsened. Whilst his popularity is far and wide in Japan, gamers perhaps best knew Samuragochi's work on the original Resident Evil and Onimusha games - the validity of which now comes into question. Preorder Infamous Second Son at Gamestop Italy, get... Red Bull and Condoms? - It's a bit of a light week for big news in games, so let's end on this bizarre promotion between Sony and Gamestop Italy, wherein gamers preordering the much anticipated PS4 exclusive are being offered to 'enjoy [their] power' with 'A fill of energy for an explosion of pleasure!'. The condoms, inspired by Delsin's Neon-based power set, glow in the dark. EEEEEEEEW.